Korean fresh tofu is incredibly bland, but the soup it's served in is hellishly hot. Korean soondubu, or "soon tofu," is fresh, soft tofu. 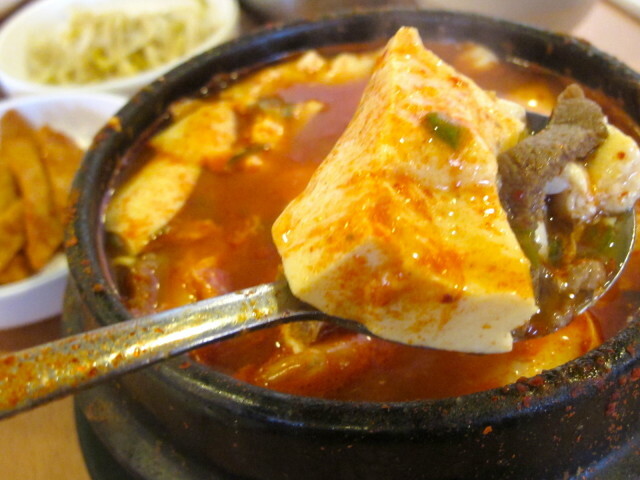 In the popular dish called soondubu jjigae, or "tofu soup," the bland, jiggly chunks of fresh-made tofu are served in a chile-spiked broth. The combination of the tofu and the aggressively spicy stock creates a startling contrast that never ceases to amaze me. I most often eat the dish at a popular Chinatown restaurant called Tofu Village. The soon tofu stew section of the menu there offers 11 variations, including "mixed tofu soup" with beef and seafood, "seafood tofu soup," and versions with mushrooms, kimchi, and other ingredients--all at the same price ($8.49). Spice levels are mild, medium, hot, and extra hot. (Make mine extra hot, I want to suffer.) Each order comes with hot rice in a stone bowl and a raw egg for you to break into the piping hot soup. The biggest concentration of Korean restaurants in Houston is along the stretch of Long Point west of Gessner. That's where most of my favorite Korean barbecue restaurants are found. But for some reason, the more recent Korean restaurants to open in Houston have been located in Bellaire Chinatown instead. Tofu Village is located in the big shopping center at 9889 Bellaire (Bellaire and Beltway 8) where FuFu Cafe, Cafe Kubo and many other of our favorites are found. Be forewarned that Bellaire Blvd. in Chinatown is currently under construction and has been cut down to two lanes.